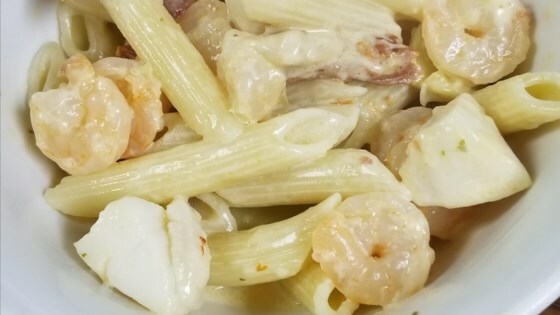 "A deliciously rich medley of scallops, shrimp, artichokes, sun-dried tomatoes and pasta! Plus it's quick and easy!" Heat a large heavy skillet over medium heat. Combine shrimp, scallops, artichokes and sun dried tomatoes, then cook until shrimp turn pink. Reduce heat, and stir in cream and parmesan. Toss with cooked pasta, and sprinkle olives on top. Absolutely yummy. The only change I made, was (of course!!) the addition of garlic, just sauted in the pan in some olive oil before adding the other ingredients.